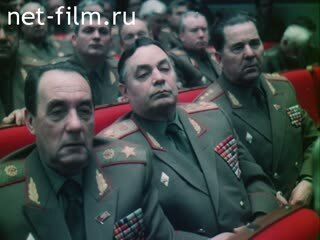 Operators: Durnov K., Izvekov V., Kuzminskiy S., Maksimov L., Sysoev V., Filatov I., Filatov I. 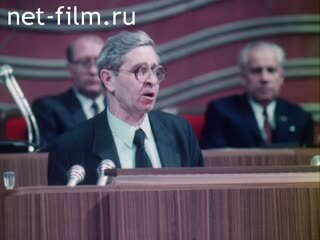 About the Russian Party Conference which became the Foundation Congress of the Communist Party of Russia. Moscow. The meeting room of the constituent congress of the Communist Party of the Russian Federation. Closing of the first Constituent Congress of the Communist Party of the RSFSR (6/IX, DPT): delegates singing the "Internationale" (synchronous) - Various., CU. persons. Sings presidium - LS. 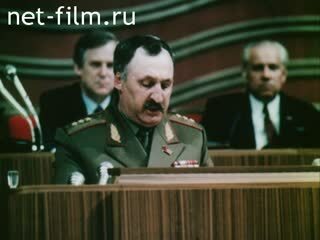 (In the Presidium Mikhail Gorbachev, Ryzhkov and others). Rolls leaf desk calendar, on another piece of the inscription "June 19» - CU. (Multrabota). 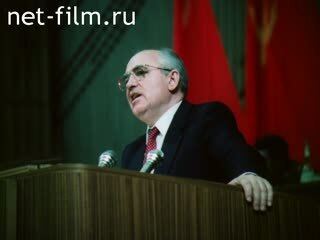 Delivers a report on the CPSU General Secretary Mikhail Gorbachev (synchronous - Russian Communist Party) - LS., MS.
PNRM. the hall DPT - LS. Listen to the Hall - MS., CU. hands of persons. Close-up of man's face in the wing cap. Speakers: Representatives of the Preparatory Committee (Congress) IP Osadchy, a representative of the Democratic Party platform in VN Lysenko, a representative of the Communist Party Marxist Platform A. Kolganov, a representative of the Leningrad Congress initiative of Russian Communists VA Tyulkin (all simultaneously) - MS. Delegate at the microphone - LS., Departure. Delegates are asked to words - LS., PNRM. VV Tereshkova in the hall - CU. Overturns calendar sheet, on a piece of the words "June 26» - CU. 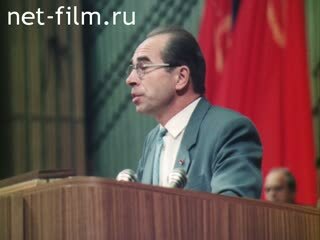 Chairman of the Supreme Soviet of the USSR AI Lukyanov read a resolution on the transformation of the Russian Party Conference in the founding congress of the Communist Party of Russia (synchronous) - LS., MS. Present in the room stood applauding - LS., PNRM. Applauds the Bureau - LS., PNRM., Departure. Delegates Congress of the Russian Communist Party lay a wreath at the Mausoleum - LS., MS., PNRM. In the lobby of the delegates distribute CDS prints - MS., PNRM. Panels depicting VI Lenin on the stage - LS. TCI Controller Boiler Plant City Biisk OA Akimkin and delegate TD Cheredilina words at the podium asking, arguing with Lukyanov (synchronous) - LS., MS. The delegates in the hall, to the microphone - MS., LS. Speakers: YN Procopius of Yakutia and AN Maltsev from Nizhny Novgorod (both simultaneously) - MS. Delegate tries to come, Hall protests, he sits down - MS., PNRM., LS. Listen to the Hall, the bureau - MS. The delegates GK Rebrov (synchronous) - MS.
MS Gorbachev in the presidium - MS. Speakers: poet DN Kugultinov, lawyer AA Sobchak, General AM Makashov (all simultaneously) - MS., LS. The military in the audience - MS., PNRM. The delegates in the hall - MS., PNRM. Speakers: Delegates OA Akimkin, IK Polozkov (both simultaneously). Animation: On the upside piece calendar date "June 21» - CU. Congress acts to First Secretary of the CPSU MGK YA Prokofiev (synchronously). The Bureau - MS., LS. Speakers: the chairman of the Leningrad City Council V. Gidaspov, AM Makashov delegates VI Ladygin, VF Ohohonin, AG Melnikov (all simultaneously). Animation: Date "22 June" on a piece of calendar - CU. Are the military band musicians - LS., PNRM. Eternal Flame at the Tomb of the Unknown Soldier - LS., PNRM. Delegates to the Constituent Congress of laying a wreath at the tomb - LS., MS.
MS are Gorbachev, N. Ryzhkov and others - MS. The passage of honor - MS., PNRM. Russian flag on the building of DPT, people in the building - LS., Departure, PNRM. MS Gorbachev among delegates - MS. (In the lobby). Delegates to the street - MS.
IK Cursor in the hall - CU. The delegates of the "Left Wing" VI Bragin (synchronously against the candidacy Polozkova) - LS., PNRM. The delegates in the hall protest, waving mandates - MS., PNRM. Actor acts VI Strzhelchik (synchronous) - MS. The delegates GK Ashin (synchronously). First Secretary of the Krasnodar Regional Committee of the CPSU, Ivan Kuzmich Polozkov elected first secretary of the Communist Party of the Russian Federation, welcomed the delegates - CU., MS. The participants applauded - LS., PNRM. Some delegates protests - LS., PNRM. IK Polozkov goes around the room - LS., PNRM., Playing (synchronous) - LS., Departure. Panels depicting VI Lenin - CU. Delegates at the microphone on the sidelines - MS.
Calendar sheet with the words "June 23» - CU. MS stands Gorbachev (synchronous) - MS., LS. Calendar sheet with the words "September 6» - CU. Delegates to the Congress under umbrellas go to the building of CDS - LS., PNRM. Delegates on the sidelines - LS., MS., PNRM. The inscription on the stage of "The founding congress of the Communist Party of Russia» - MS. Person listening to the delegates - CU., MS.
IK acts Polozkov (synchronous) - MS., LS. The delegates IP Vtorushin, Y. Prokofiev (both simultaneously) - MS. The delegates: VA Shiryaev, a representative of the Air Force Academy, NS Carpenters, IM Boltovskii, NM Shmytko (all simultaneously) - Various. The overall plan of the hall - PNRM., Departure. Speakers: Professor of Leningrad MV Popov (synchronous) - MS., Delegate IP Osadchy (synchronously). IK Polozkov the podium - CU., Stands - LS., MS. (Synchronous). The delegates in the hall laughing and applauding - CU., MS., PNRM. The delegates VP Bayduzha (synchronous) - MS. Continuation of VP Bayduzhi (synchronous) - MS. Poet speaks DN Kugultinov (synchronous) - MS. Listen to the Hall - CU. persons, MS.; military in the audience - MS.
Delegates raised on the escalator in the corridor CBC - LS., MS., PNRM. Hall ballot - LS., PNRM. The voting procedure - LS., MS., PNRM. 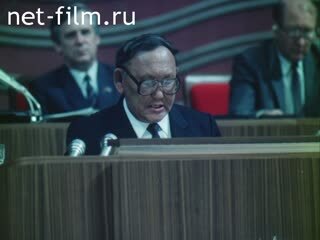 VA says delegate Tyulkin (synchronous) - MS.
MS Gorbachev, AI Lukyanov and others are in the foyer - LS., PNRM. The delegates YP Belov (synchronous) - MS.
Calendar with the date "September 6» - CU. Delegates, including MS Gorbachev, sing the "Internationale" (synchronous) - MS., LS., PNRM. The Bureau applauds - LS., PNRM.